1. DIY Ladder Shelf Shoe Storage: Keep shoes tidy by storing them vertically. 2. Over the Stairs Mudroom: No space for a mudroom? These stair-cubbies beg to differ. Make the most of the space where shoes, coats, and gloves will inevitably end up. 3. Hidden Key Storage: There are certain things that are best kept by the door, but that doesn't necessarily mean they need to be seen. Unsightly objects can be kept contained behind a pretty picture. 4. Mail Basket: You need a place to toss your mail. We're loving this simple leather strap stunner! 5. Order of Things: Put hooks, containers, and mats in your entryway to correspond with the order in which you unload at the end of the day. Always take your shoes off last? Put a shoe rack at the end of your mudroom. 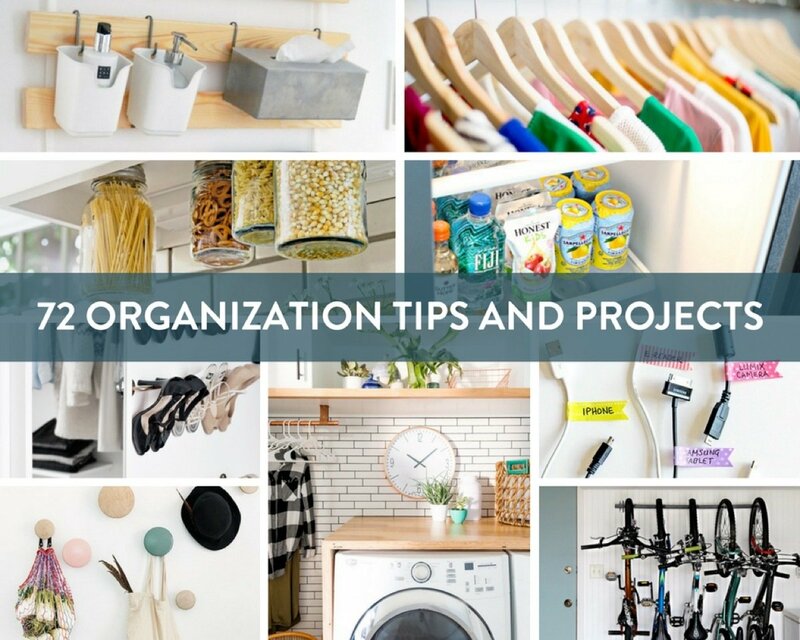 Keeping things simple will keep you organized. 6. Narrow Boxes: If you're limited on space, mount a narrow shelf on the wall to store what you need. 7. Wall Dots: If you're looking for a cleaner look, simply mount wall hooks to hang your belongings. 8. Giant Calendar: Putting a calendar by the front door means everyone can stay on schedule. 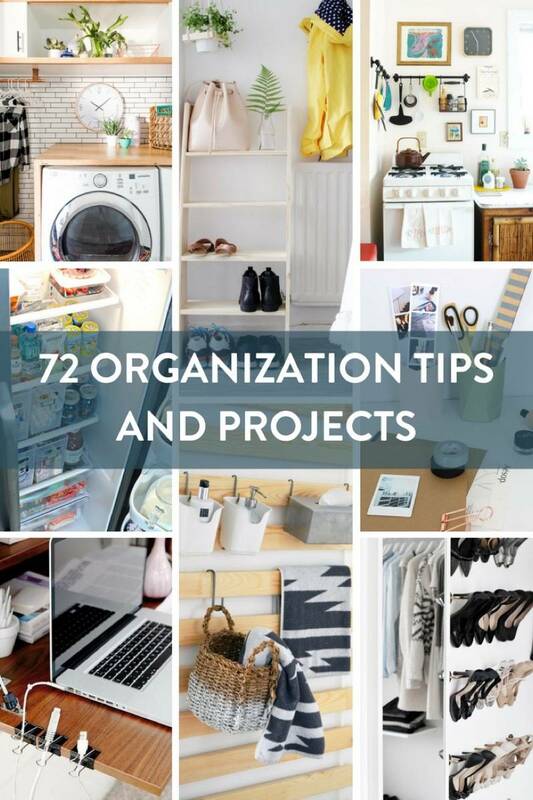 Get a giant planner like this one to organize absolutely everyone's agendas. 9. IKEA Entryway: If you don't have one, create your own mini-mudroom. A bench and this Fintorp rack from IKEA are just enough to keep the entryway tidy. 10. Recycling Station: If you have the extra space, organize your recycling by the back door to keep it out of the kitchen. Use a pegboard and baskets to sort items. 11. Organization Board: Use metal boards and magnets at the entryway to keep kids' homework and assignments in order. 12. Umbrella Station: Make a space for everything and every situation. 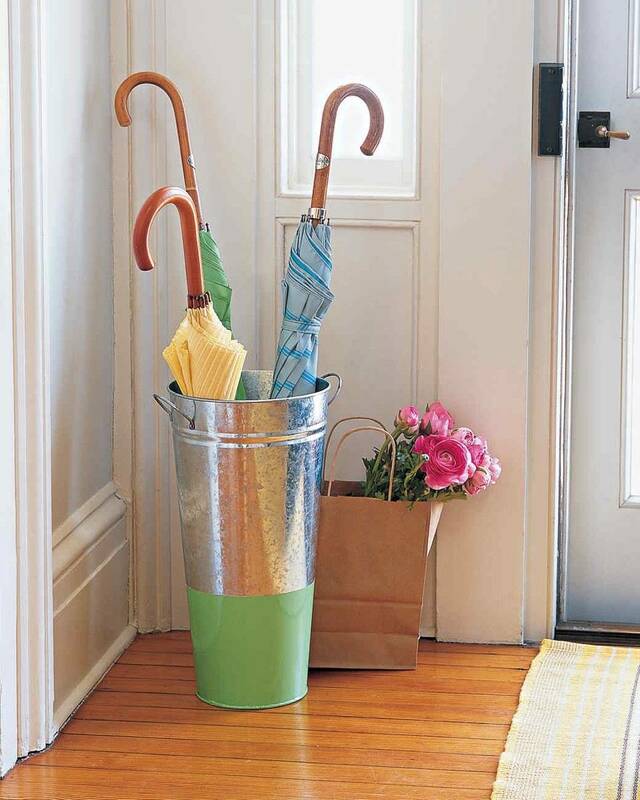 A heavy duty container (like this metal bucket) is perfect for storing wet umbrellas. 13. Small Space Kitchen: Organize pots and pans on a wall-mounted pegboard. 14. Fridge Bins: Step up your refrigerator game by keeping similar foods in labeled bins. Bonus - create an "almost expired" bin for food that's about to go bad. Store it near the front of your fridge so you're sure to pull from it first! 15. 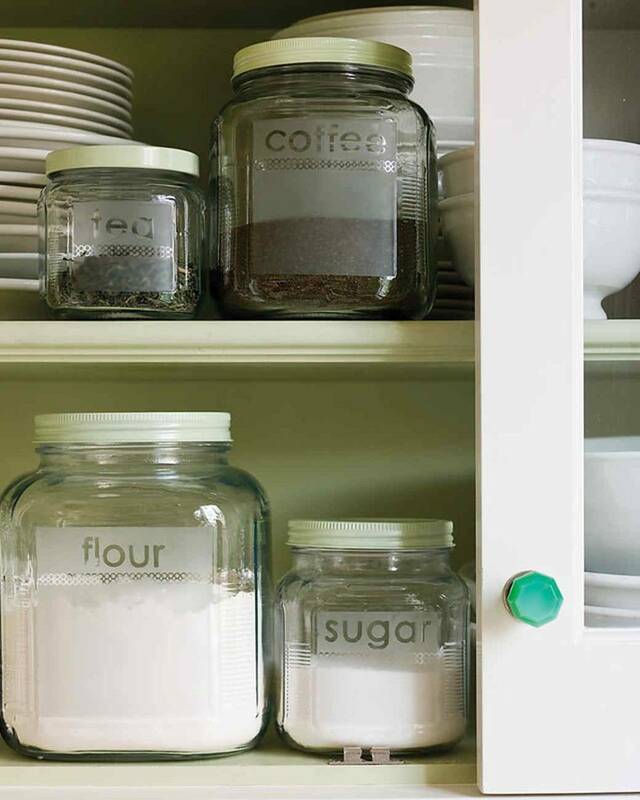 Etched Glass Storage Jars: It's one of the classic organization tips: keep track of dry goods by storing them in matching containers. 16. Magic Decals: If etching isn't your speed, try organizing with easy-to-apply decals. 17. Fridge Work Station: If you can put a magnet on it, it can be stored on your fridge! Create a mini command station by using small boxes and magnets to store all your odds and ends. 18. Bookshelf Pantry: If your home doesn't have a pantry, make your own by using bookshelves. 19. IKEA Fintorp Kitchen Organization: Take advantage of any empty wall space by using a bar and hook system. 20. Cupboard Pocket Organizers: Don't waste the space inside your cupboards! These plastic envelopes are perfect for keeping track of receipts, mail, and bills. 21. Magnetic Towel Bar: Make the most use of metal surfaces by utilizing magnets to hang what can't fit on your countertop. 22. Hidden Kitchen Organizer: Take your cupboards to the next level by making this DIY command station just inside the door - no more clutter on the refrigerator! 23. Canned Food Organizer: Store cans and jars on a rolling cart next to the fridge. 24. Airtight Containers: Cut down on wasted pantry space by trading cardboard containers for uniform glass ones. They'll keep food fresh for longer, and they're easier to organize. 25. Wire Spice Rack: Store seasoning directly on the wall for easy access. 26. Trash Bags on a Roll: You use them frequently - make them easy to reach! Store trash bags on dowel rods under the kitchen sink. 27. Tension Rod Organizer: Speaking of under the sink... you can easily keep cleaning bottles within reach by storing them on a tension rod. 28. Junk Drawer: The junk drawer doesn't have to be a pit. Use rubber bands to store like-items together. 29. Magnetic Knife Rack Hooks: Knife strips do double-duty. Use magnetic hooks to keep track of odds and ends. 30. DIY Hanging Organizer: It's as pretty as a picture, but also holds all your stuff! If you don't have any room on your desk, use wall space to store additional office supplies. 31. Wood Desk Organizer: Take control of desk clutter by creating a unique wood slab organizer. 32. DIY Cardboard Organizer: Here's an organization tip for you: You don't have to spend a bunch of money just to have a non-cluttered desk. Make your own organizer from layers of cardboard. 33. Magnetic Dishes: Never lose another paperclip. Keep a magnetic dish on the side of your filing cabinet for pushpins, binder clips, and other metal odds and ends. 34. Chalkboard Filing Cabinet: Paint a filing cabinet with chalkboard paint so you can label and re-label drawers as needed. It's also great for scrawling notes to yourself. 35. IKEA Double Duty: This Fintorp rack system can literally be used in any room of the house. Here it is storing pens, pencils, and other tools via small buckets. 36. Paper Pencil Cup: Again, organization doesn't have to be expensive! These pencil cups are made from paper. The main goal when organizing a desk is to keep like items together, and frequently used items within easy access. 37. DIY Hanging Baskets: Go vertical with your storage using hanging baskets. 38. Wood Desk Organizers: Being hands-on means being able to keep everything uniform and matching. Make your own desk cubbies from wooden craft boxes. 39. Anthro Knock-Off Gold Organizer: Can you believe this is made from old cans? Being organized can be so glamorous. 40. Wrapping Paper Rolls: Use small hooks and dowel rods to hang gift wrapping paper. 41. Plastic Bottle Bins: Can you believe these used to be plastic bottles? Organization on the cheap! By hanging these containers, they can be easily moved and rearranged as needed depending on the project you're working on. 42. Printer-in-a-Basket: Unsightly electronics don't have to be seen. Hide 'em in a basket. 43. Washi Tape Cord Labels: Mark your cords with colorful washi tape to avoid the dreaded "pile of wires". 44. Desk Drawer Dividers: Don't let your desk drawers become endless pits of junk. Improve efficiency by storing them in dividers. 45. Binder Clip Organizer: No more looking under your desk for that missing plug! Keep cords in the same place by affixing them to your desk with a binder clip. 46. Stacked Pants: Save on space and spare the wrinkles with this IKEA hack for hanging pants. 47. Enforce Limits: Use restraint when storing your belongings in a communal closet, like this hall closet. It's everyone's space - be mindful! 48. Bungee Organizer: These stretchy ropes hold just about anything. If you don't have the built-in space to hold your belongings, try creating your own. 49. Let There Be Light: Adding a little light to your closet will make locating things a breeze. Use a stick-on L.E.D. lamp or strip of lights to illuminate the space. 50. Heel Bar: Keep your high-heeled shoes scuff-free by storing them on the wall with a towel bar. 51. Organize Linens: By folding sheets inside of their corresponding pillowcases, you're sure to never lose track of a set! 52. Utilize the Whole Space: Closets are small by nature, so don't waste a single inch. If you have space on the floor, you can use it to store shoes. Space above? Store objects you don't need everyday access to, like out-of-season clothing. 53. Slide-Out Scarf Organizer: Scarves are tricky to keep organized, but this DIY sliding organizer does the trick. 54. Laundry Countertop: Use the space above your laundry machine by creating a folding station out of wood. 55. Laundry System for Kids: Give your kids their own (labeled) laundry bins to teach them the importance of taking care of their belongings. 56. Re-purposed Drawer Shelves: Mount a brightly colored drawer above your washing machine for added storage - plus the drawer pulls act as hooks! 57. Iron-on Laundry Labels: If you sort your laundry as you're putting it in the basket, guess what you don't have to do before washing a load? Keep your colors separated with labeled bins. 58. Properly Fold Your Sheets: Your laundry will look seamless once you learn how to fold those pesky fitted sheets. Plus when folded properly, they take up way less room in your closet. 59. Pallet Rack: This pallet-and-hook organizer is interchangeable, making it an ideal solution for those of us who like to rearrange. 60. Wire Earring Organizer: Earrings are notorious for getting lost. 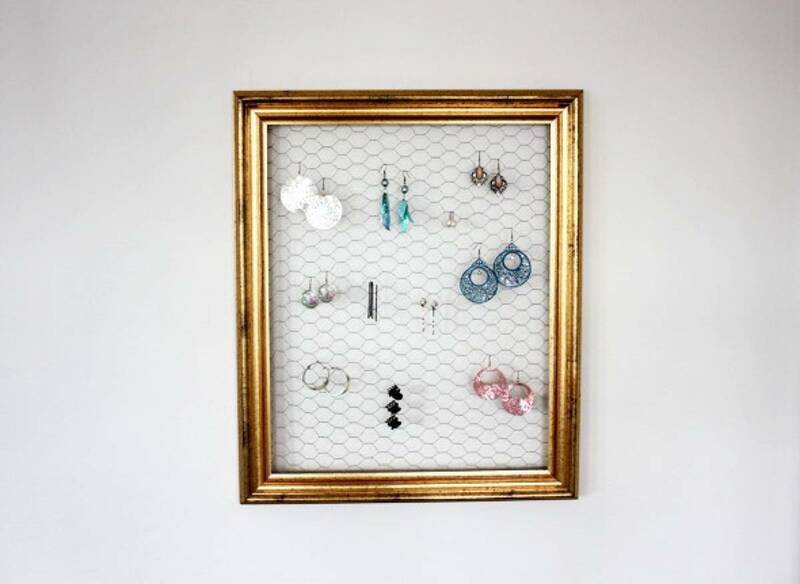 Display what you have and keep track of your collection with a frame and some mesh wire. 61. Towel Rack: No shelving in your bathroom? Bring in your own, like this IKEA-hack towel rack. 62. DIY Ring Box: With a cardboard box and some foam, this ring holder is almost too easy. 63. Vertical Bike Storage: Bikes can take up a lot of space in a garage or basement. Try storing them vertically by mounting hooks to a wall or a low ceiling. 64. 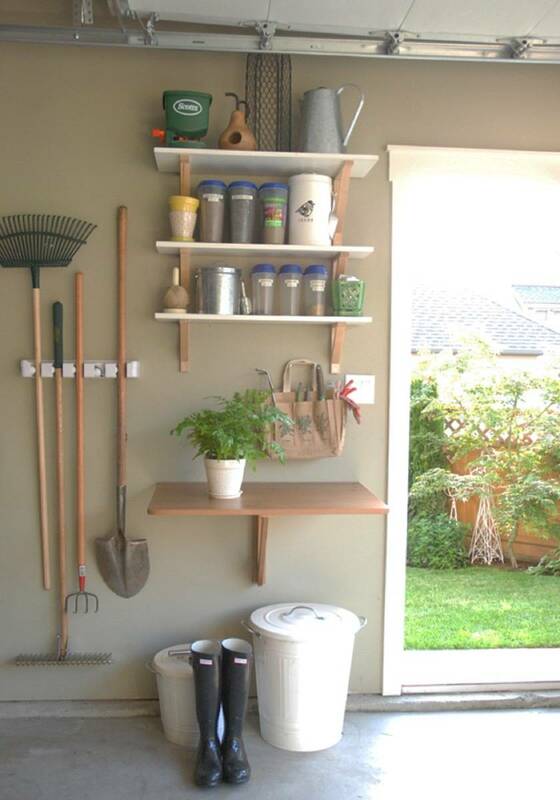 Garage Garden Station: As there usually isn't a focal point in a garage (other than the car), it's easy for things to feel like they're getting out of hand. By storing similar items together, your garage will develop a sense of cohesiveness. 65. Screwdriver Rack: Store your tools with... well, other tools! 66. PVC Tool Storage: Few things are more frustrating than repeatedly knocking over the same shovel every time you move things around in your garage. Cut out that horrible clanging sound by keeping yard tools in this awesome do-it-yourself PVC storage system. 67. 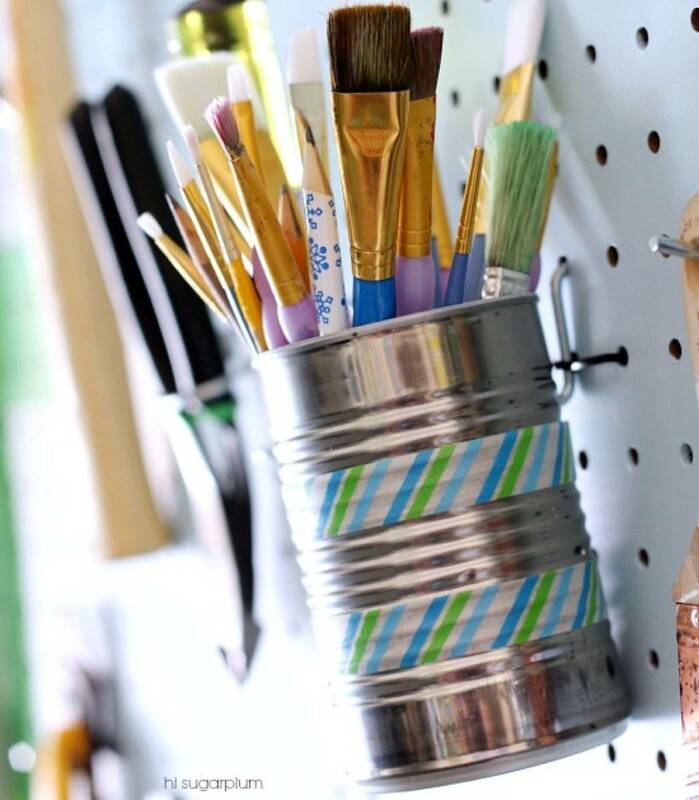 Pegboard and Can System: Organize efficiently and for less by using recycled cans. 68. Gutter Shelving: You heard that right. Gutters make great shelves! 69. The "Hold Everything" Tool Rack: The ultimate craftsman's storage system. 70. PVC Power Tool Holder: PVC is at it again! These large pipes make perfect containers for power tools. 71. Magnetic Holder: A knife holder can be a great solution to keeping track of drill bits. 72. How to Organize Paint: Wide-mouthed jars are great for holding touch-up paint, plus they're easier to shake and mix than a full bucket. Do you live in an apartment or rental? Check out 70 of our favorite apartment-friendly DIYs! @Nancy Ross - Glad you enjoyed this list! Thanks!